In this novella, Binti, our main character, has been accepted to Oomza University, the finest university the galaxy has to offer. Not only that, but she’ll be going there on an academic scholarship. Only, accepting the offer will mean giving up everything – her home, her family, all of it. On the way the university, the ship is attacked by Meduse – a warlike creature feared throughout the universe. The story is quite short, coming in at just under one hundred pages. Despite this, it is quite powerful. It begins after Binti leaves home and begins the long journey to Oomza University. The story is told in third person, from Binti’s point of view. There is something magical in Okorafor’s characters, the main character not least of all. Binti is a very wonderful, very well rounded character. She is torn at once between her family and the history of her people, and the greater world beyond. Binti is smart – she thinks in terms of numbers and math. It’s wonderful to see a character so blatantly brilliant in so many facets. Yet, Binti is still quite human, walking a tight line between the beliefs and traditions of her people and science. She still gets scared. This extends to the side characters and minor characters as well. The strangers Binti passes on her way to the ship and those she meets once aboard feel very real despite only having a few lines dedicated to them. I grew quite fond of several characters despite their brief appearances. The world Okorafor builds is extended this same care, too. Despite this book being one in a series, two of which have already been published, it most definitely feels like a complete story. Binti can absolutely be read as a standalone novel, require no further commitment from the reader. The characters are so rich, Binti such a likeable character, and the writing so atmospheric I dare you not to want to read more. Now, as with most short fiction, the messages and ideas conveyed in the work are bit more blatant than perhaps found in longer fiction. I have no problems with this, but it is something to keep in mind for those who feel differently. 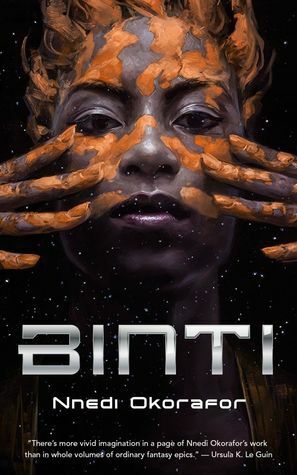 There is a lot to love about Binti by Nnedi Okorafor. It’s at once a tale of a young woman leaving her whole world behind and beginning something entirely new, and a tense, more traditional science fiction novel. If you like stories featuring non-typical main characters, science fiction, and novellas, definitely pick this one up. If you don’t like shorter stories, like a bit more in the way of subplots, or aren’t a fan of science fiction this may not be the book for you.